CLoud 9 Living v Bukurešť, Rumunsko: Zarezervujte nyní! 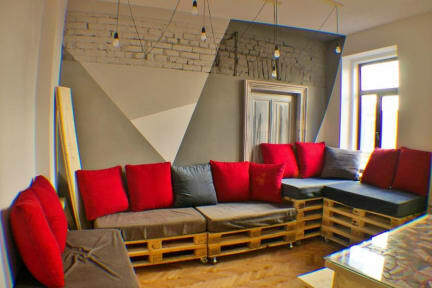 Cloud 9 Living is a new, 100% handmade, welcoming apartment located in the heart of Bucharest. Our apartment is in a building that's more than 100 years old and rated as an historical monument (Cinema Bucuresti - the first cinema in Bucharest). You'll get to stay in a place with great history, modern facilities and a modern, cute, industrial look. We are proud to say we have the best location in the city. If you choose to stay with us not only will you be 5 minutes away (walking distance) from the main places of interest in the city, but you'll also have the greatest park, Cismigiu Gardens right around the corner. 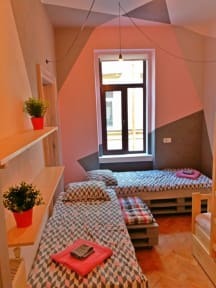 Although we are situated in the busy center of Bucharest, our unit is one where you will have peace and quiet. CLoud 9 Living offers comfortable private rooms. Some rooms of this guesthouse also feature a private bathroom. There are a shared kitchen, as well as a shared living room and a terrace at the property. Check in from 14:00. PLEASE NOTE THAT YOU HAVE TO INFORM US ABOUT YOUR ARRIVAL TIME. As we don't have a reception, please let us know what time you are arriving!